Date: Oct 25 2018, 6 p.m. - 7:30 p.m. It's Halloween Bunco time! 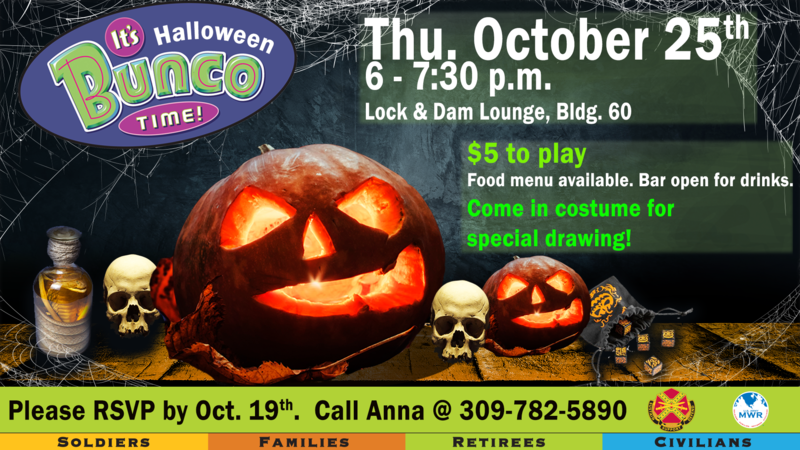 Join us at the Lock & Dam Lounge for some spooky dice game fun. Bunco is very simple to learn so even if you've never played before, don't let that keep you from coming out. Cost is $5/player and the Lock & Dam Lounge will be serving food and drinks as well. For more info or to RSVP by Oct. 19th, call 309-782-5890.